!! This baby boy is Special !! Sorry if you’ve already seen this since it’s kind of old, but in January The Mirror published a complete list of Britain’s No. 1 hit singles since 1952. As bloggers are wont to do, let me relate this to myself by saying that during the week I was born, “Ghost Town” by The Specials was number one. 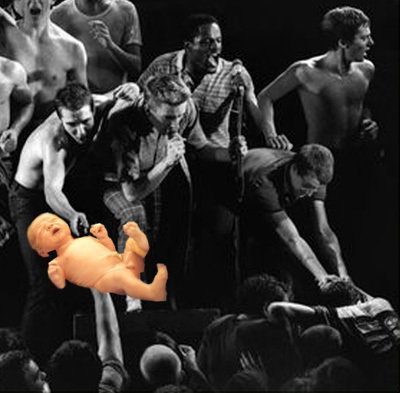 I wasn’t that into ska revival as an infant, but my parents decided to take me to their concert anyway, where the above photo was taken. I recall enjoying the part of “Ghost Town” with the creepy children singing the Egyptian riff. I sort of wish my mom could have had me a week earlier so Michael Jackson‘s “One Day In Your Life” would have been my song. It’s a beautiful torchsong and he sings it like a true lady. Or maybe I would rather have been two weeks late so Aneka‘s “Japanese Boy” could be my song. Even if it’s a bit racist, you can’t deny that catchy beat. » NEXT ENTRY: Learn to be a Starr! Be the first to comment on "This baby boy is Special"